We are excited to offer Digital Meridian Imaging (DMI) as a cutting-edge, diagnostic tool for our patients. I had known about digital meridian imaging for some time. Then I had an opportunity to experience it first hand. Once I did, I quickly realized the extraordinary benefits it could bring to our patients. I got excited about how we can use this diagnostic tool in our practice. The first is when a new patient comes into the clinic with complex issues. I then find it very useful to use the DMI to get to the root of the problem quickly. My patients like it because it gives them something to visually see. 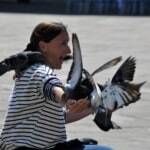 Since acupuncture works with energy, sometimes the results are really obvious. For example, in helping to alleviate pain. Other issues are a bit more difficult to pin down via “how the patient feels.” The DMI helps to the analyze the more esoteric measurements. The other way that I use the DMI is on existing patients. I feel I can get to that deeper level, that simply is not revealing itself to me. If my existing patients come in with a problem that we just aren’t moving, I will often want to do a DMI to see what is the underlying issue that we aren’t seeing. It has produced amazing revelations for me and thus my patients. What is Digital Meridian Imaging™ (DMI)? DMI is the process of measuring the electrical resistance of acupuncture points. It’s not a far leap from the familiar EKG or EEG used extensively in allopathic medicine. The green lines means that meridian is normal or within limits. The red indicates that the meridian is in excess, thus working too hard. The blue indicates the meridian is deficient, which means it’s not working hard enough. And the purple indicates a split. That means the meridian is unbalanced either right side to left of the body, or top to bottom on the body. 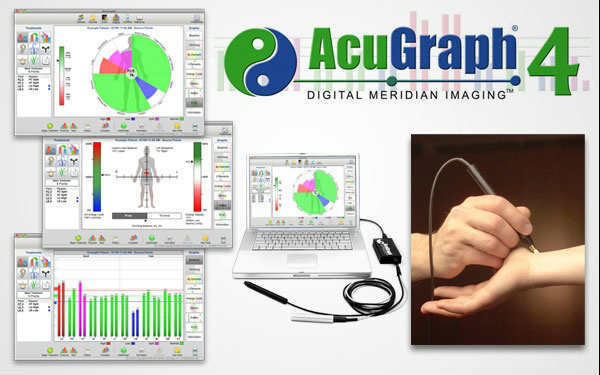 Based on the energetic readings, the digital meridian imaging software informs the acupuncturist of the most effective points to use for the treatment that day. It includes acupuncture treatment protocols as well as Chinese herbal formulas, plus a place to insert our own protocols. A history function displays the patient’s results over time using a line chart to easily see how the patient has progressed from the initial reading to today. This is an invaluable tool for helping a patient objectively see how they have improved instead of subjectively relying on how they feel or using the 1-10 point scale. I personally love this piece, as I have had patients who never felt like they were improving and yet I saw huge changes. And the opposite is true. I have patients that feel like they need to tell me they feel better when in fact they may just not be as in tune with their pain levels. This gives me concrete data to assist me in my treatment. The graph below is an example. 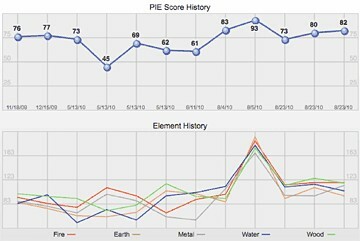 The graph above displays history function of the patient’s element results so, for example, you can track their water element fluctuating wildly in relation to their fire element (severe menopause). As the patient’s symptoms are controlled, it shows their elements becoming stable. The comparison function compares past exam results side-by-side. This might be used to see how the patient presents differently in the beginning of a month versus the middle of the month, during their menstrual cycle, before and after significant events in the patient’s life, or to see how they have changed since first being seen. The evidence-based text report gives a short explanation of the channel functions, the patient’s results, what those results mean and probable signs and symptoms the patient may experience. 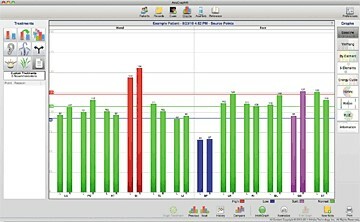 DMI function has the ability to print or email results and graphs to a patient. This objective proof of the patient’s progress helps further healing. Please know that using this tool doesn’t replace our clinical skills. It’s a tool to be used with wisdom and skill like any other tool. You absolutely need our ability and knowledge to interpret the DMI graphs correctly, to determine which herbal formula is best, to choose the appropriate treatment plan, and to manage your care. Please contact us at 503-246-0103 to schedule your assessment. If you wish to have a treatment following the assessment, simply let our staff know and they will schedule you accordingly.